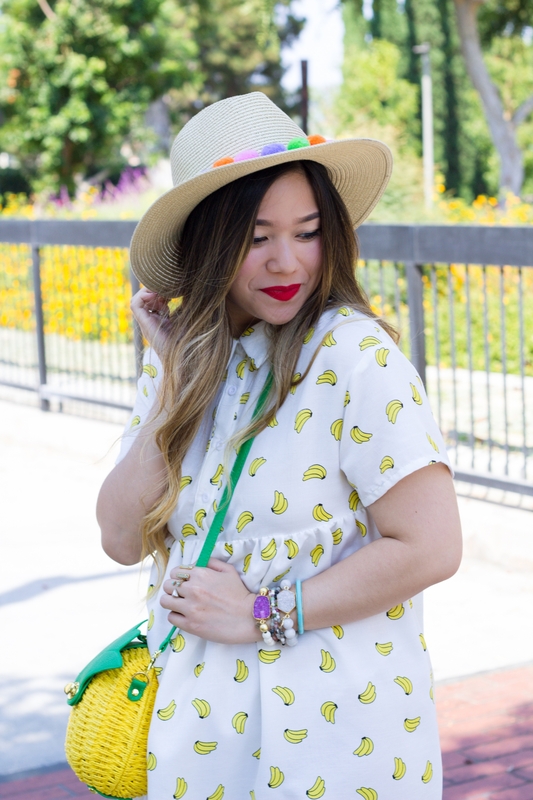 This button down banana print dress has the cutest collar, too! I just love all the preppy vibes this dress exudes! Can you tell how excited I am from all my exclamation marks??? 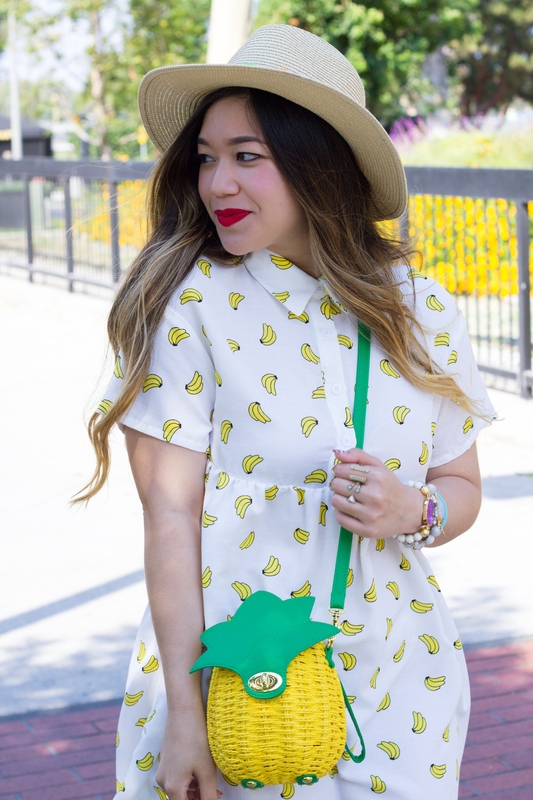 haha I’m trying to contain my excitement but this banana print dress is just too cute, I can’t!! 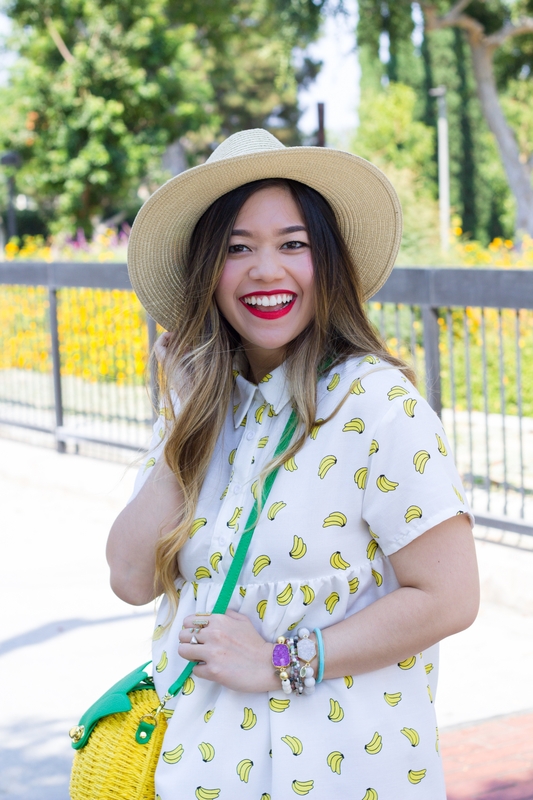 The best part about this banana print dress? It’s only $16! 🙌🏻 You can snag it here! For reference, I’m wearing an extra small! Because of the babydoll silhouette, I knew I had to size down or else this dress would literally drown me. 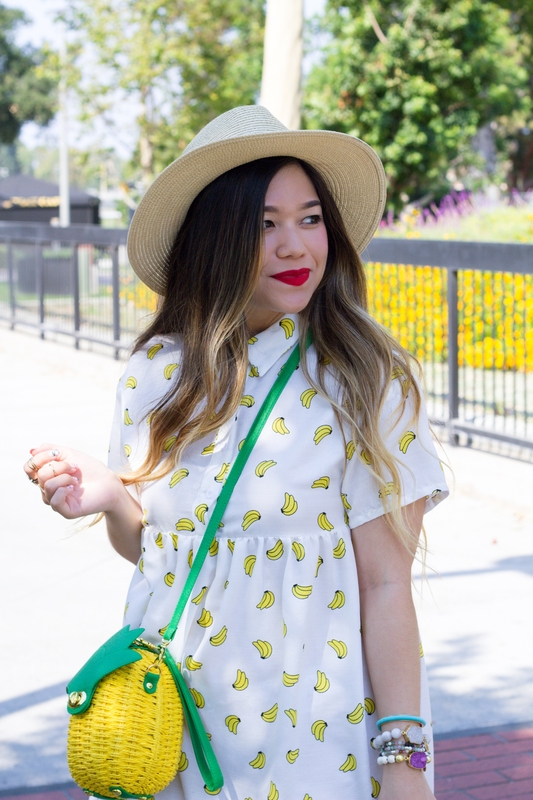 In celebration of the fruit fashion trend, I obviously had to pair this super adorable banana print dress with my equally adorable pineapple bag! Unfortunately, my pineapple bag is currently sold out! It keeps getting restocked but then it sells out super quick, ahh!! What a cute outfit! I love the fruit fashion trend. Maybe it’s because I love eating fruit LOL. I’ve noticed a lot of lemon print and pineapple print clothes around lately. Your banana dress is really cute too, and at such a great price! this outfit is just so fun from head to toe! obsessed with how you mixed the fruit prints, and i love your shoes too! OMG this outfit it the cutest!! 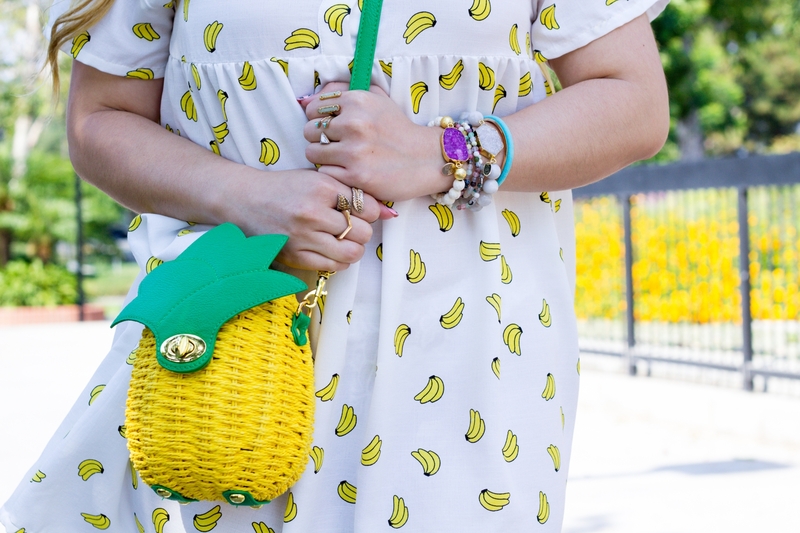 I don’t know which I like more – the banana print or the pineapple bag! OMG, how cute is this whole outfit?! Love it! I love that dress and that hat is way too cute! I would wear it! This is the cutest outfit! 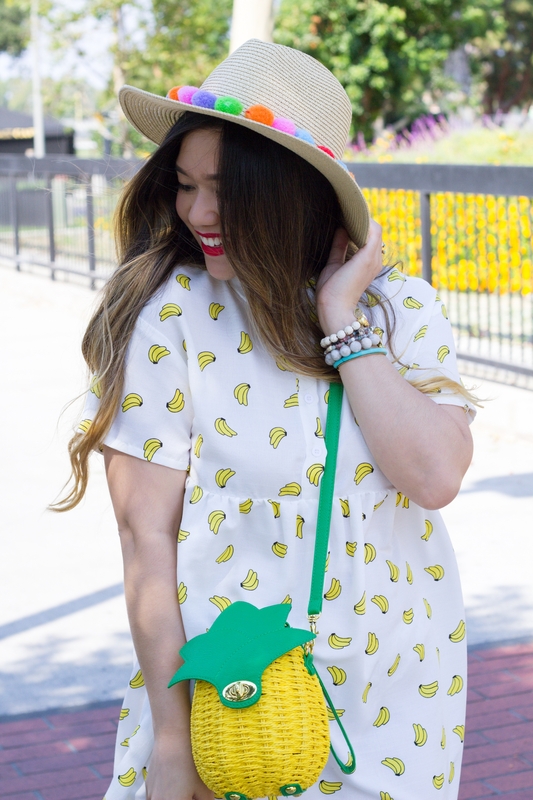 I absolutely adore that pineapple bag! How fun is this outfit?! 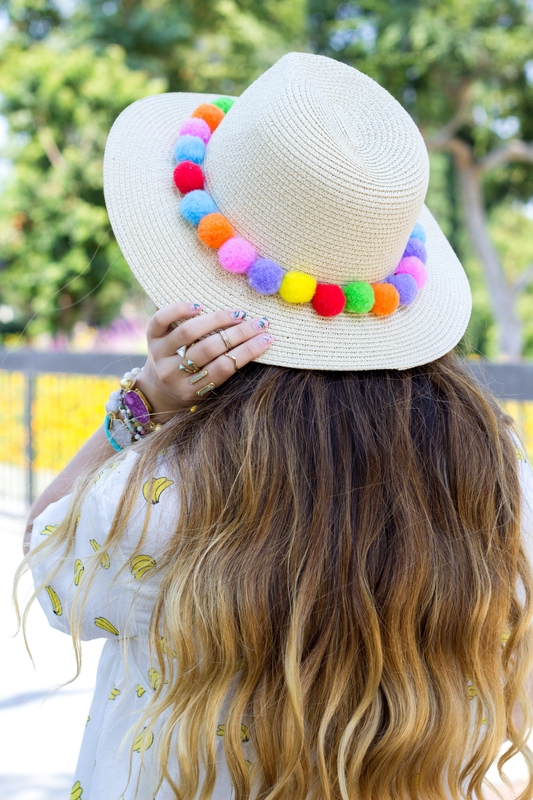 I love the banana print and pom pom combo, looks so cute! You are the cutest!! What a fun summer look! I love your dress! !